Get ready for the biggest yoga event to hit Beirut. 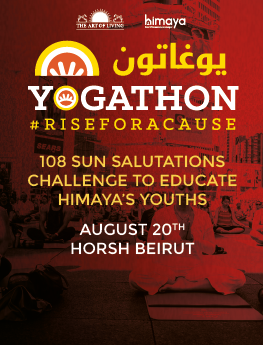 On the 20th of August, join us at Horsh Beirut to participate in the global 108 sun salutations challenge! Your participation will allow us to raise funds for the education of the children of our Resilience Center. "Yoga" originates from Sanskrit in which the word literally means "unite". Let us do so together and #riseforacause.Register now!